Event lighting is such an important part of your party or event, whether it’s a Corporate Event, Launch Party, Gala, Bar / Bat Mitzvah, Sweet Sixteen, Wedding etc. Lighting sets the atmosphere, creates color, highlights flowers or lounge decor, and can change your entire set up instantly bringing everything to life! One of the simplest methods of creating an atmosphere for your Corporate Event, Launch Party, Gala, Bar/Bat Mitzvah, Sweet Sixteen etc., is by the use of uplighting. 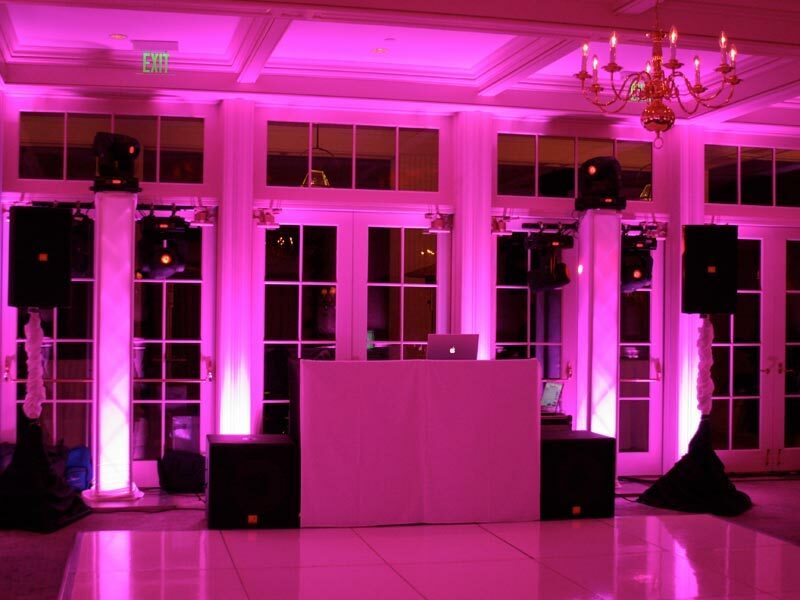 Uplighting entails illuminating the perimeter of the venue, including outdoors, with any color or combination of colors that you like. By using LED lighting fixtures, changing the colors of the lights is easily accomplished. The uplighting at your party can change the atmosphere from cocktails to dinner to dance party. We can supply your event lighting with both wired and wireless uplighting or any other style of lighting for whatever type of event you are putting on be it formal or informal with an endless array of colors. A wireless fixture is perfect for outdoor events or another area in which power supplies are constrained. LED lighting does not generate much heat and is therefore also energy efficient. Ambience lighting is sometimes called Wash Lighting as it puts a light color overlay on a wall, ceiling or dance floor, creating an atmosphere of light color at your event or party. Projection lights and Gobos are used to project a pattern, logo or initials on to a wall, ceiling or dance floor in any color you choose. This kind of lighting can from a template or personalized to your theme (such as hearts for Valentines or snowflakes for winter). 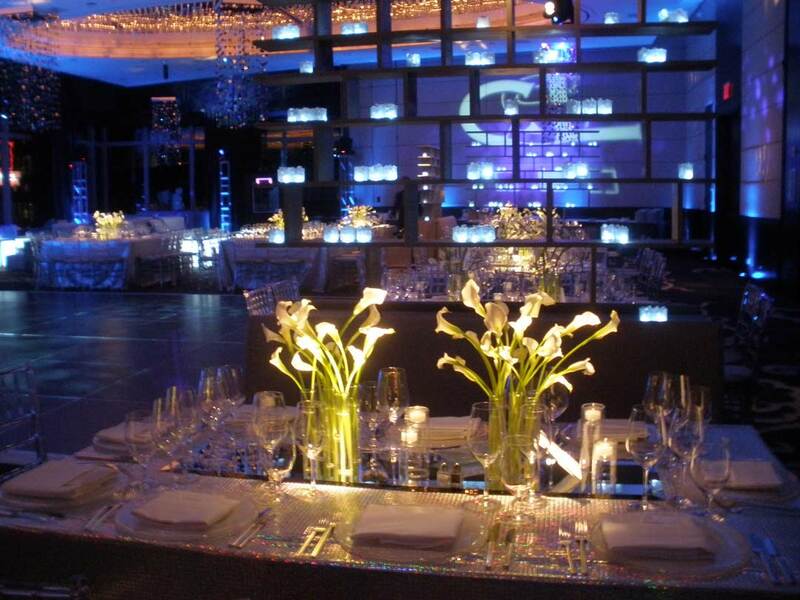 Pin spot lighting is when a narrow light beam is used to focus on an object such as the floral centerpieces. These lights are pointing down from a pole or truss and add a dramatic appearance in the room. 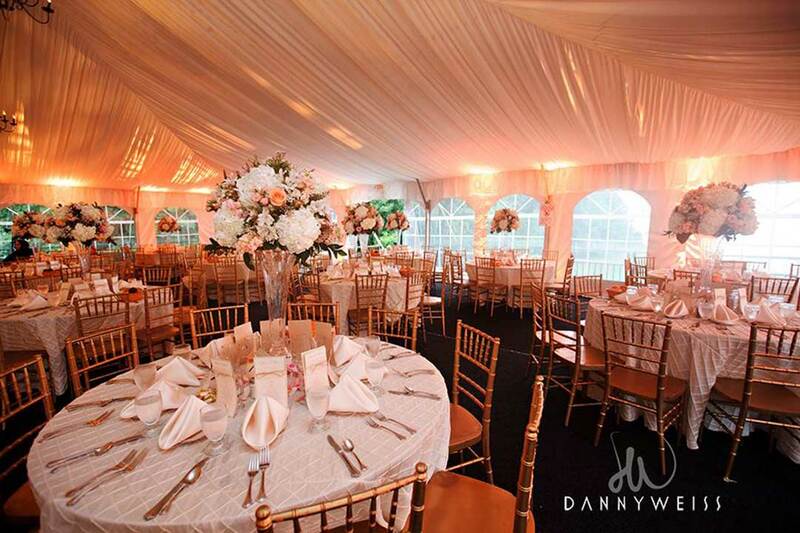 If your event is in a tent, the lighting is just as important as any place else. Like all the other lighting that Tower Productions offers for every kind of event., we will set up, position and colorize your tent lighting to your specifications. Accent lighting is used exactly as the name sounds, to accent a particular area such as an ice sculpture, centerpiece(s), head table, dessert bar or regular bar at your party event. The lights are offered in a variety of colors and should be matched to the theme of the party. There are various options for Outdoor Lighting such as uplighting against trees or buildings or providing a warm glow overall to your bar/bat mitzvah, sweet sixteen etc. We understand how important planning and producing your event is and we will collaborate with members of your team for a stress-free production. Whatever type of event you are putting on, be it corporate or personal, our professionals will work with you to develop a theme and set the mood for your event. We will deliver, set up and operate the equipment throughout the event to ensure that everything runs smoothly.